Hey, lovebugs! Welcome to the final installment of my BH Cosmetics California Palette Mini Series! The last palette of the collection is the San Francisco palette. San Francisco is one of the most beautful and well known places in Northern California, and is very different from Southern California. San Francisco is known for the Golden Gate Bridge, cable cars, Lombard Street (the crookedest street in the world), Pier 39, Fisherman's Wharf, China Town, foggy weather, Alcatraz, amazing, fresh seafood and it's flamboyant nature. San Francisco was originally named Yerba Buena – In 1835 SF was called Yerba Buena, Spanish for “Good Herb”, a fragrant mint plant that grew along the shoreline of the bay. In 1847 the name was changed to San Francisco after Saint Francis. The Beatles’ last concert was held at Candlestick Park on August 29th, 1966. They began this historic concert with “Rock and Roll Music” and ended it with “Long Tall Sally”. This event lasted all of 33 minutes. There are over three hundred coffee houses within the city boundaries of San Francisco. 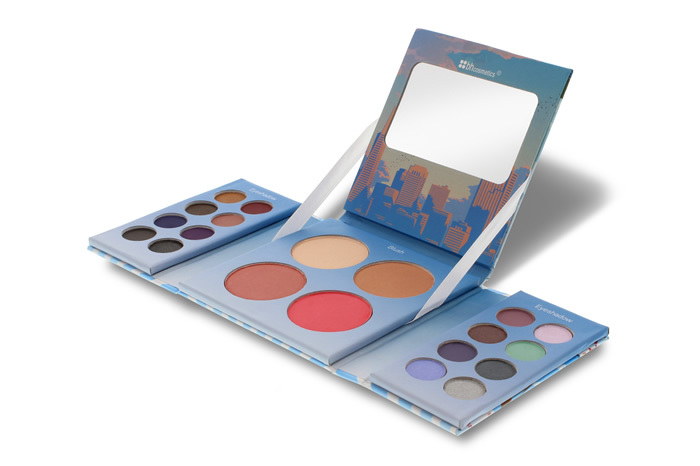 The BH Cosmetics San Francisco palette is just like the other two in the California collection (Hollywood and Malibu). The case is cute, compact, made with sturdy cardboard and comes with a handy dandy mirror to look fab on the go. It is adorned with the iconic Golden Gate Bridge on the top of the palette and the San Francisco skyline along the base of the mirror. Unlike the other two palettes though, you get a selection of 16 very wearable eyshadow colors, two blushes, a bronzer and a highlighter. You get a variety of light and dark shades, as well as different textures like matte, shimmery and glitter finishes. This palette is ideal for the fall and winter seasons! Just like the two previous palettes, and as you can tell from the swatches, these are very pigmented, smooth and last a very long time on the lids, especially with a good primer. You get an excellent color payoff for the tiny price the BH Cosmetics offers. On the left side of the palette, you get a nice shimmery/glitter golden bronze shade, a beautiful matte reddish brown that I love wearing in the fall months, a matte dark brown, a matte, light warm taupe, a matte navy blue, a gorgeous matte plum, a matte black (that has a slight warm undertone) and a glittery black. 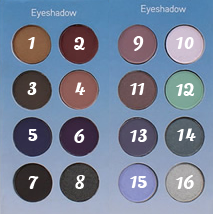 The right side of the palette includes a dark matte, warm taupey-purple, a shimmery iridescent white-purple duo-chrome that is lovely as an inner corner highlight, a shimmery taupe-brown, a pretty matte sea foam green, a matte muted blueish-purple, a shimmery, sparkly forest green that is spectacular, a light shimmery cool purple and a shimmery light silver. The shimmery shades of this palette perform the best. The mattes are very pigmented, but they tend to be a bit on the powdery side. 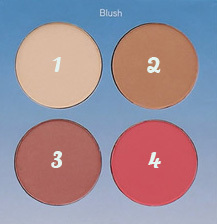 The compact palette also comes with four cheek colors which includes a highlighter, bronzer and two blushes. The highlighter is a nice shimmery light champagne gold that will give light skin a glowing complexion. The bronzer has a very slight shimmer to it, and it's a great shade for my fellow fair skinned people and it's not orange, hooray! The two blushes are amazing. One is a shimmery rose gold that is very rich and luxurious and then my favorite is the matte bright coral pink. It is extremely pigmented so a little goes a very long way. I hope you guys enjoyed this mini series! I always have fun creating unique looks for you guys, and I love being inspired by beautiful places as well. Take care, and I'll see you again soon! Really amazing look! I love all three of the palettes the pigmentation is beyond amazing! Great job! Gorgeous! This just reinforces my cravings for those palettes. Oh I just love this look! You're so talented!